the sink. I haven’t cleaned a pan in days. I can’t think of a good reason to sweep the floors. I won’t see him until he is drunk and pleased. a missing earring in the wash.
a finch go to and fro her nest. Aaron Dargis grew up in Michigan and lives in the Piedmont area of South Carolina. He is currently an MFA student at Converse College and Poetry Editor for South 85 Journal. His most recent poem appearing Panoply Magazine, “Grey Partridge,” won editor’s choice. His primary focus is on identity of the self within a geographical location, isolation, and memory. 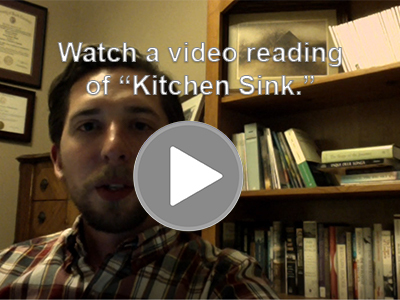 “Kitchen Sink” first appeared in Panoply Magazine: https://panoplyzine.com/kitchen-sink-aaron-dargis/.